Fully specialized in software for treating information needed by railway's operational processes, mainly for train operators and maintenance services. With far more than a decade-long experience in handling railway planning and operational data, Fretless Idea is the ideal partner when you need excellent railway-specific data models and metadata. Our analysis always covers uttermost details, leaving no chance to chance. If you need a supplier which bends software technology for you, Fretless Idea is the choice. Already have a consolidated ICT supplier? You can boost your projects by hiring Fretless Idea for functional analysis, architectural validation and to relax your models in order to get the most out of your information systems. Logbook is an information system in the cloud which replaces the paper logbook in the locomotives. 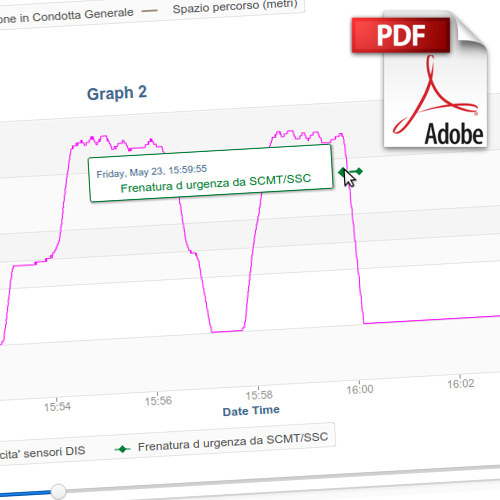 When you start using our virtual logbook you will experience close-to-realtime data exchange between the locomotive, the ECM, the maintenance workshop and the fleet managers. No more paper sheets, no more delays in information exchange between maintenance and operations. No more lost information. The tablet replacing the paper logbook can record information even in absence of internet connection, I.e. during the train journey. Train drivers You can see locomotive conditions and limitations before starting the journey, and you can track anomalies happening during the train run, even if no internet connection is available at that moment. Operation centers You get realtime updates from the train drivers, the ECM and the maintenance workshops. Locomotive handovers from operations to maintance and back is tracked in the system. By a glance in Logobook's dashboard you will know which rolling stock is more suitable for each commercial service. ECMs You receive realtime updates from the train driver and the operation centers. Data quality is increased as more readable and including important information, I.e. the weather conditions when the anomaly happened and the accurate detection time, so you can easier perform cross checks with other diagnostic information. You can apply and remove limitations to the fleet units based on safety requirements you want to enforce. Workshops You get the maintenance history of each rolling stock and realtime updates from train drivers and the operation centers. You know days in advance which spare parts and tools you will need to restore each rolling stock functionality. You can close anomalies and track informations that will help you in future troubleshooting. Locolog is a tool in the cloud which, starting from the digital data downloaded from the locomotive, identifies on your behalf situations, behaviours and technical events concerning train drivers and locomotives. Its continuous and systematic data analysis is ustomizable both in logic and in alerting. Locolog can accept both realtime data and timed downloads of the event recorder's memory. Railway instructors It is a new and fundamental tool searching significant train driver events and behaviours on your behalf. Situations are indexed and displayed in graphical formats from which you can navigate the data and perform graphical data analysis and measurements. From any fixed and mobile modern device connected to the internet. Managers Locolog brings a higher level of knowledge in your company by allowing office to index and analyze operational situations. Measurements and indicators can be extracted from real operational data and used for risk analysis and any other report. Interoperable Locolog is the ultimate interoperable tool for handling in a single place multiple data formats and with web access from almost any modern device connected to the internet.